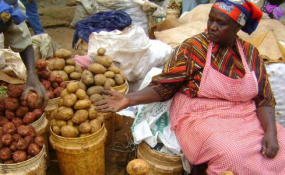 A trader displays potatoes ready for sale (file photo). Nairobi — Nairobi Traders and Small business association will on Wednesday hold a major protest against what they term as government harassment of their business. Organizing Secretary Ann Nyokabi says all businesses in Nairobi will close shop paving way for traders to hit the streets in all major roads. Nyokabi says over 3000 containers worth Sh12 billion have been seized with the government claiming they goods imported are substandard. "Most of our members are being auctioned and defaulting on loans because they can't pay loans. Some of the goods belonging to thousands of small traders have remained stuck at the port for months," she said. According to Nyokabi, their challenges vary from harassment by police officers to arbitrary arrests of their members as well as frustrations on clearance of imports from the port. She says all efforts to have discussions with the government have not been fruitful. "It should be remembered that it is the said challenges that led us to exercise our constitutional right of picketing about two months ago prompting the government to have a sitting with us. However, it's rather sad that the many resolutions reached out of our meetings have never been honoured by the government," she said. Some of the resolutions during the meeting with the government included unconditional release of seized containers which the government has not adhered to. "To add salt to injury, due to the imminent and inevitable piling up of containers at Mombasa port, an auction for the same goods has been advertised without care to the importers burden and worse still cartels are ready to purchase the goods at a throwaway price," she explained. In August, the small-scale traders and importers in Nairobi sought a petition from the Senate seeking the release of their consignments from the Port of Mombasa following implementation of stringent cargo clearing measures by government regulatory agencies. The traders also called upon the government to stop the blanket destruction of imported goods at the port, saying that a few contraband goods in a container of consolidated goods should not warrant destruction of the whole consignment. Last month, President Uhuru Kenyatta witnessed the destruction of illicit goods worth Sh1.5 billion including 149 motor vehicles. Before setting the contraband ablaze and witnessing the crushing of the vehicles, the President said that the war against corruption, contraband, counterfeits and all forms of economic crimes will be sustained, cautioning politicians to stop politicising the crackdown.